Fundraising: Annual Stewardship Campaign; Annual Christmas Gift Shoppes & Tea Room; spring, summer and fall Community Flea Markets; indoor winter flea markets or tag sales Growth Campaign In June 2016 we successfully completed the commitment phase of the Sowing, Hoeing and Growing for God’s Harvest Growth Campaign. 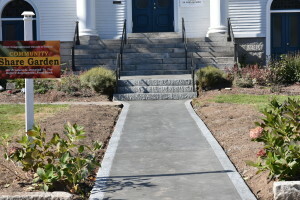 During the next three years monies committed will be used to update the heating system, replace sidewalks and add parking, support a mission trip and increase the reserve funds of the church. Three meetinghouses have served the parish, including the current one which was erected in 1829 on the east side of Main Street. Moved across the street in 1853, it has been added to and renovated several times, including our newest addition, dedicated in 2001. Our sanctuary has several unique features: a stained glass window given in memory of Clara Barton, founder of the Red Cross; a baptismal font made from a Native American grindstone presented by the Joslin family who are known for their pioneering work in the control of diabetes; “angel” windows in the upper gallery; and a beautiful pulpit made by member Steven Richardson in 2004 and dedicated to the memory of Diane Brodeur, a longtime church secretary. In addition to our beautiful sanctuary, our facilities include a new education wing, conference room, large fellowship hall, and first-floor church office and pastor’s study with private entrance.